This is a sample entry from Craig Turner’s email newsletter, Turner’s Take, published on February 19, 2014. 1) CORN: How Far Can Corn Rally? March corn is now trading above $4.50 and has stopped us out of our short position from $4.25. While I remain bearish on corn prices for 2013/14 and 2014/15, you can’t deny these low US corn prices have spurned demand from exports, ethanol and animal feed. The USDA’s latest estimates have the 2013/14 ending stocks at 1.481 billion bushels. At those levels $4.50 corn is justified. I do think that USDA will add back a couple hundred bushels in the March 1 or June 1 stocks report, but there is no reason to play that game now. In the mean time, I would like to focus on Dec Corn. The Ag Forum will have their first 2014/15 corn production estimates early Friday morning. We are expecting a trend yield of 165 bu/acre and 94mm acres, 2014/15 project carryout gets to about 2.0 billion bushels and that could mean $4.00 corn. A lot can happen between now and harvest. We haven’t planted one seed of corn, and the weather from now until harvest is always the ultimate trump card. I do like selling Dec Corn here because it looks like $4.50 will be resistance for March Corn and later this week the market could act very bearish to the Ag Forum numbers. Trade Rec (Spec Futures): Sell 1 Dec Corn at $4.65 or better, GTC. 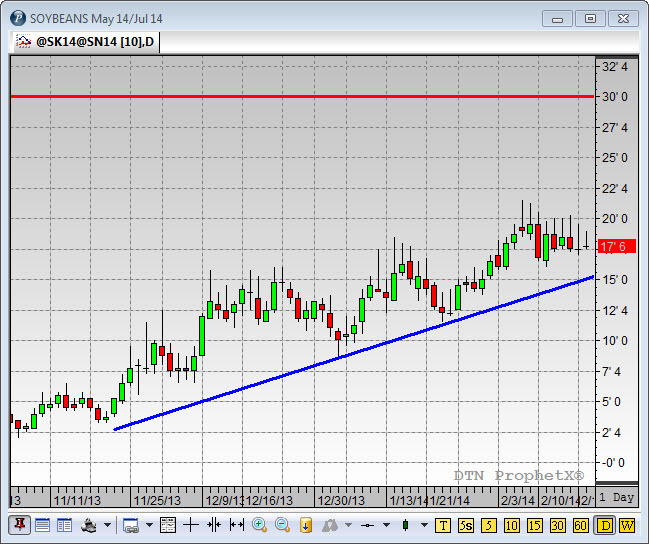 Risk to $4.80 and keep the profit target open. Trade Rec (Hedge with Options): Buy the $4.60/$4.00 Put Spread and Sell the $4.60/$5.00 Call Spread for a debit of 7 cents, GTC. Looks to make 53 cents if Dec Corn settles below $4.00 after option expiration settlement. The risk is 47 cents if Dec Corn settles above $5.00. Hedgers may want to pick up an extra $5.50 call for an additional 12 cents for insurance against a drought in 2014. 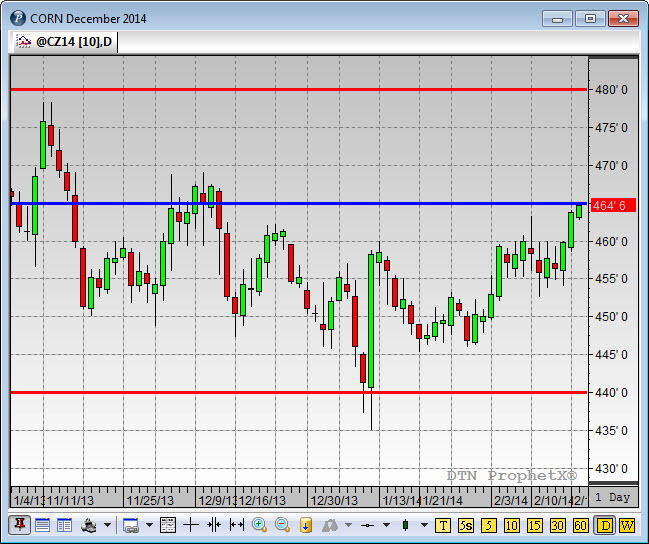 Over the next few months demand for US Soybeans could cause the old crop to range by a few dollars. If China cancels old crop purchases, switches orientation to Brazil, or rolls to US new crop, old crop Soybeans will most likely break down and trading in the $12.00 area again. However, if we don’t get cancelations then we could have a situation where we are just as tight as last year or tighter in terms of available supply. Playing Soybeans is a big boy’s game when stocks get this tight, so to keep the risk relatively low, I like taking a look at May vs July Soybeans (SK/SN). We are trading around 18 cents now (May over July) and if the market gets really tight like it did last year and the year before, the spread went out over 30 cents. With a margin of $500 per spread and a four cent risk, I like the risk reward. As you can see below, the trend line has been strong since November. If we break below 15’0 the trend will be broken so that is why the stop is at 14’0. Trade Rec (Spec Futures Bull Spread): Buy May Soybeans and Sell July at 18’0 cents or better, GTC. Risk 4’0 cents to 14’0 ($200 risk). Target is $30’0 ($600 gain). Margin is $500 per spread. Crude Oil has rallied due to cold weather, draws on stocks and a weakening dollar. While Crude has been bullish, it is overbought, the US and Global economy is still sluggish, and some of the spread markets are historically in the high range. 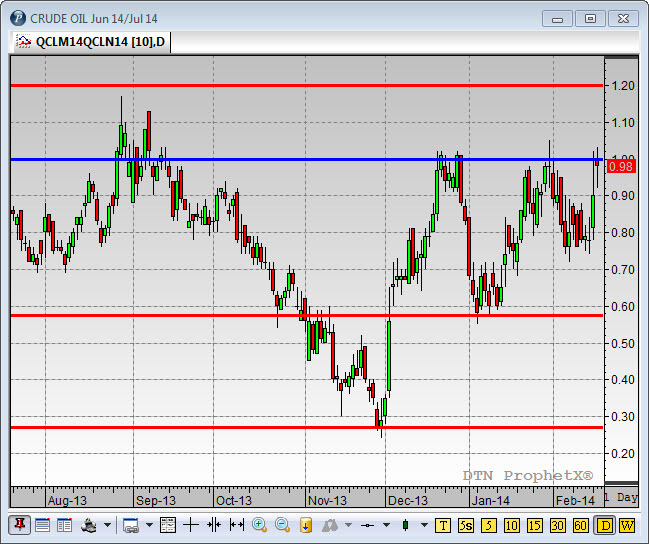 If you look at June vs July Crude, we are trading at about $1.00. That means June Crude is trading $1.00 higher than July. This has only happened 8 times in the past 30 years. The only times we materially broke above $1.20 was 2003, 1996, and 1989, all during oil price shocks. I like selling this spread at $1.00 and risking to $1.20 (20 cents of risk is $200). The high for the year is $1.17 (see chart below). If the market really takes off we get stopped out, but if we do hold these levels and reverse lower when the weather gets warmer (which it should in the next few weeks), we could go to 60 cents maybe even 30 cents. That could be a gain of 40 cents ($400) to 70 cents ($700) on a futures spread that only requires about $400 in margin. Trade Rec (Spec Futures Bear Spread): Buy July Crude Oil and sell June Crude at $1.00, GTC. Risk to $1.20. The target is open but we will be focusing on 60 cents and then 30 cents. Margin is about $400 per spread.